Special Pet Preparedness Book Discussion: "Pawprints of Katrina: Pets Saved and Lessons Learned"
Arlington Public Library and the Arlington County Office of Emergency Management present a special book discussion focusing on the often overlooked need for pet preparedness in the event of unusual weather or other circumstances. 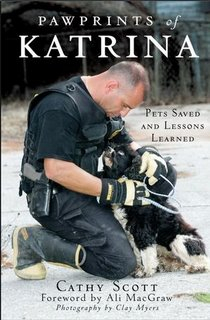 The session at Central Library on Wednesday evening, Feb. 24, will feature expert advice on safety preparations to take now on behalf of your pets plus a discussion of the powerful journalistic account "Pawprints of Katrina: Pets Saved and Lessons Learned" by Cathy Scott. The book provides a moving testimony of rescues and reunions involving animals that were separated from their owners during the devastating hurricane that tore through gulf states in August 2005. Registered participants will be able to borrow a copy of the book at the Central Library reference desk between Jan. 25 and Feb. 24. Those who attend the discussion will receive a free pet preparedness starter kit, which includes a collar strobe light, a collapsible bowl and a waste bag dispenser.